Normally I’m a sweet rather than salty girl, but every now and then I crave something crunchy and salty to go with my lunch. So what did I opt for today? Michael Season’s Baked Cheddar Cheese Curls! These curls are gluten and wheat free, and are baked rather than fried. I agree with the logo on the package for “feel good snacking”- these curls were both delicious and a good snacking option! 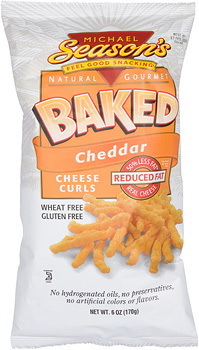 I opened up the bag and saw a bunch of cheese curls. Some were skinny and long, others wide and short. An assortment of pieces all covered in an orange powdery coating. After eating a few, I really like these! Crunchy, airy, cheesy and salty! It was a very sharp cheddar flavor, with a salty after taste. Certainly needed a drink with these! 1 cup (28 grams) is 130 calories, 4.5 grams of fat, 20 grams of carbohydrates, 2 grams of fiber, 1 gram of sugar, and 2 grams of protein. Are you a fan of chips? I never really was one to reach for chips when it came to snacking, but as of lately, I noticed that they go perfect with or after my lunch. When I’m not necessarily hungry, but still in the mood to munch! -A bag of Michael Season’s Jalapeno CHEESE PUFFS! *Extra Entries* LEAVE A COMMENT FOR EACH!! 2. (*2 extra entries*) Add me to your blogroll/Follow Me!! 3. (*2 extra entries*) Link this giveaway to one of your posts. 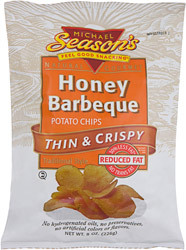 LUCKILY- Michael Season’s makes versions of your typical unhealthy fare that are much more diet (and heart!) friendly. All of their snacks are healthier, and don’t contain all those nasty ingredients some companies put into their snacks. 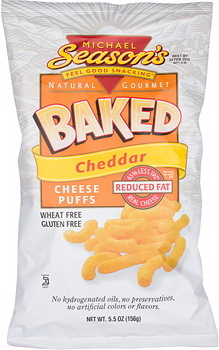 The company sent me a few of their snacks to try, and one of my favorites was the Baked Cheddar Cheese Puffs. Not only are these all natural, they are wheat and gluten free, have no hydrogenated oils, no preservatives, no artificial colors and no artificial flavors. AND- I was sent a bag of them in a pre-portioned 100 calorie pack- gotta love portion control! Each one of them is about the size of your pinky finger, and a dusted with a coating of cheesey powder. What I liked was that it didn’t leave my fingers all greasy or ORANGE like some other cheese puffs can. The taste was amazing! STRONG cheesy flavor, similar to cheetos, and you can definietly taste the buttermilk undertones of flavor. Salty and cheddary, they provide a burst of flavor and some guilt free snacking. Plus, you get a lot in the bag for 100 calories! Normally 100 calorie packs scrimp on portions, but you get a good amount in each bag. Kudos, Michael Season’s, you get 4 1/2 stars! 1 bag is 100 calories, 3.5 grams of fat, 15 carbohydrates, 1 gram of fiber and 2 grams of protein. Organic Cornmeal (40%), Cornmeal, Corn Oil and/or Sunflower Oil, Whey, Reduced Lactose Whey, Butter (cream, salt, annatto extract), Buttermilk, Cheddar & Blue Cheese (cultured milk, salt, enzymes), Salt, Disodium Phosphate, Lactic Acid, Natural Flavor, Color (paprika, tumeric, annatto), Citric Acid. HEY! Ya know what goes good with cheese puffs? ALMOND MILK! well, not really.. but enter my giveaway, anyway! !